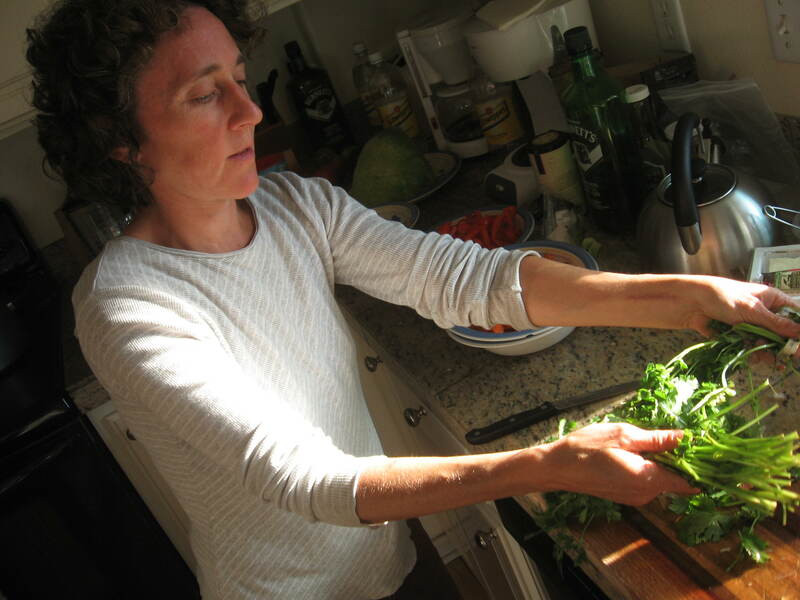 I am a chef and nutrition educator, and have been working in the local food movement in the Twin Cities for 25 years…Since I first entered the food scene in the Twin Cities, I had a desire to connect my love of community, land and food, and there it was. In 1996 I opened the Good Life Cafe with my friend Karn Anderson. It was a joyful time. After selling the restaurant in 2001, I got married and had babies, still working to educate about food. My passion continues to be connecting families to health through food. Healthy people, healthy land, healthy communities! I am the resident chef/educator at the Minnesota Landscape Arboretum, finishing my Master’s in Public Health Nutrition at the University of Minnesota, and just published a Cookbook-Cooking Up the Good Life (see link) including many of my favorite recipes featuring local, seasonal, whole foods and ways to engage kids in the process of gaining food literacy. Now, my family is off on a new adventure to spend a year living in Mendoza, Argentina. I am hoping to learn and explore all that I can about food from every perspective: from the Culinary world, to the world of Nutrition and Health, from Sustainability in Agriculture to Sustainable Communities…..stick around and see what I discover! Hurray!!! You have a blog. I love it! Glad to have signed up. I am so enjoying your cookbook too. ps – Making your ginger cookies right now. Think I goofed. 6 cups of flour? Hi Wendy, thanks so much for the support! Please spread the word about the book, and the blog! Hi Jenny – I met your husband at Refugio Natacion outside of El Bolson about a week ago, and he gave me your blog. I absolutely love it! I feel like your mission regarding food and nutrition aligns directly with mine, and I would love to talk to you more about your experiences over the years. My two friends and I are hiking the length of South America over the course of a year and will be in Mendoza in early March. If you are around, I would love to chat with you/pick your brain a little bit! Otherwise, my email is sarahbeth.field@gmail.com and our blog is http://www.eathikesleephike.blogspot.com (where you can find my mini-bio on the “about us” page). I look forward to reading more!! Salud! Hi, my name is Chyna Bounds and I’m from the Walker Art Center in Minneapolis. I was looking to find some contact information for authors of this blog, as we are looking for Minnesota food bloggers for an upcoming project. Let me know, and thanks for finding me! I live in Charleston, SC & am a member of the local Unitarian Church. Our Green Sanctuary committee plans to have a ‘Low and Local’ potluck for Earth Day to feature ethical eating concepts. I found your article “Eating Low: Back to Basics” on the Do It Green Minnesota website. Would you be willing to let us excerpt some information from your article for a church newsletter notice about our potluck? You explain the ideas so well. I would be happy to have you use anything you like, and of course appreciate credit. I published a cookbook last year that you might find interesting/useful-from the U of Mn Press “cooking up the good life” Check it out!